Weasler Introduces Metric Profile Drivelines - Weasler Engineering, Inc.Weasler Engineering, Inc.
Weasler Engineering provides the most extensive and trusted range of driveline products for agricultural equipment available today. 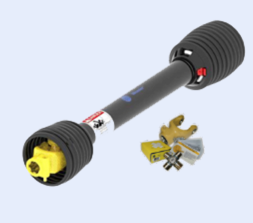 Our driveline systems, or power take-off shafts, are used by all major agriculture equipment OEMs and carried by agriculture equipment dealers worldwide. To better serve our global customers, we’re pleased to introduce a complete line of metric drivelines designed to meet a diverse range of implement applications, including beet harvesters, combine headers, disc mowers, peanut harvesters, post hole diggers, hay tedders, tillers, snow throwers, and more. Our metric drivelines feature “lemon”, “tri-lobe” and “star” profiles, which are utilized by European agricultural OEMs. Our customizable metric driveline solutions are sold under Weasler’s Profile brand and proudly manufactured in the U.S. to the highest quality standards. All of our components are designed for maximum flexibility and extended life, which saves you time and money with fewer replacements.The Weasler yoke design uses cast iron, not plastic, collars for improved durability — even in the harshest environments. All Weasler cross and bearing kits provide longer life with high torque capacity. If you choose, the standard cross and bearing kit can be upgraded to a Weasler “E-kit”, which offers increased torque capacity and extended lubrication cycles from 50 to 250 hours. That helps to further reduce the risk of costly downtime for you. The driveline efficiently transfers mechanical power between farm tractors and implements. This system of conveying power helped to revolutionize North American agriculture. Weasler’s Easy Lock Guard system is a simple solution to help prevent contact with the drive components from improper driveline handling. Now an industry benchmark, our Easy Lock Guards are standard on all Weasler North American and Weasler Profile (metric) drivelines. Unites the tractor PTO master shield and implement power input connection with our guard to form an interactive guarding system. Is simple to remove and reinstall as needed for maintenance using a screwdriver or other common tool. Meets and exceeds all industry safety standards. Whether you need a single component or a complete driveline, Weasler Profile metric products can be designed to meet your specific OEM applications. If needed, we’re able to shorten the length of our driveline to meet your exact requirements for a seamless fit into your equipment. Click here for more information, including part numbers and specifications. If you have a specific question, call Weasler customer service at 262-338-2161, or email us at oemsales@weasler.com.